It’s hard to believe it is already late August and this year’s Google Summer of Code is all wrapped up. The past couple of months have really flown by. In the previous post I summarized the feedback we received on the new UI design and discussed the work I’ve been doing to port the current UI (for editing events and tasks) to a tab. In this post I’ll describe how to try out this new feature in a development version of Thunderbird, and give an update on the HTML implementation of the new UI design. In my next post I’ll share some thoughts on using React for the HTML UI. 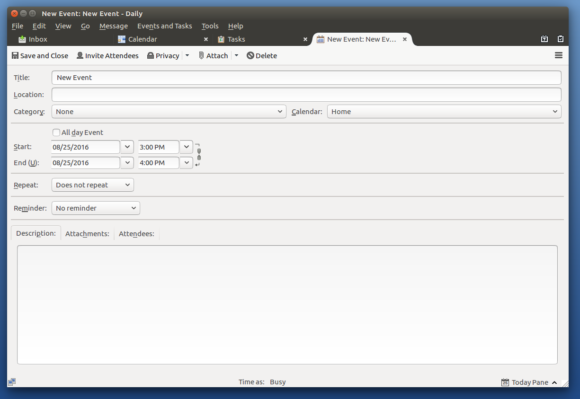 To try out editing events and tasks in a tab instead of in a dialog window you’ll need a development version of Thunderbird (aka: “Daily”). Since it is a development version you will want to use a separate profile and/or make sure your data is backed up. Once you have that all set up, you can turn on the “event in a tab” feature with a hidden preference. 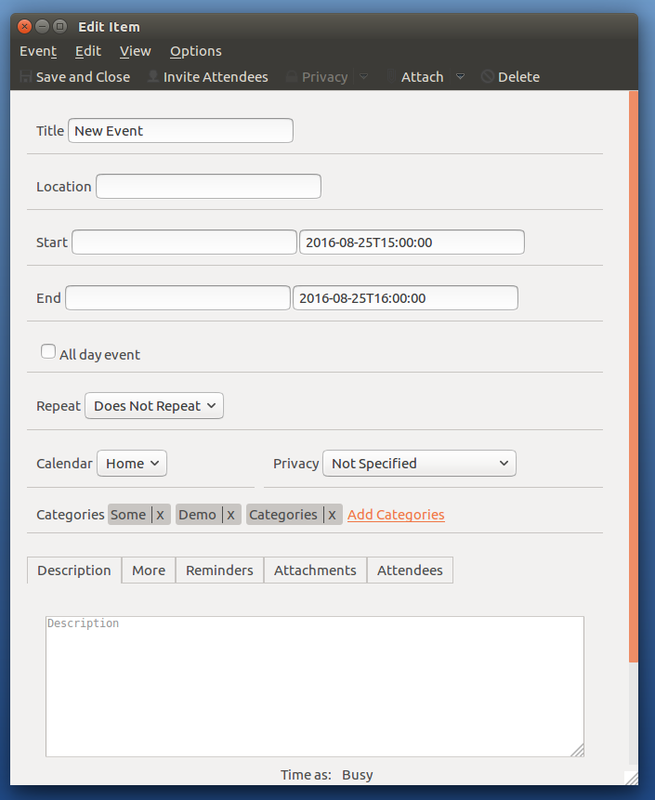 To access hidden preferences, go to Preferences > Advanced > Config Editor, and then search for “calendar.item.editInTab” and toggle it to true by double-clicking on it. 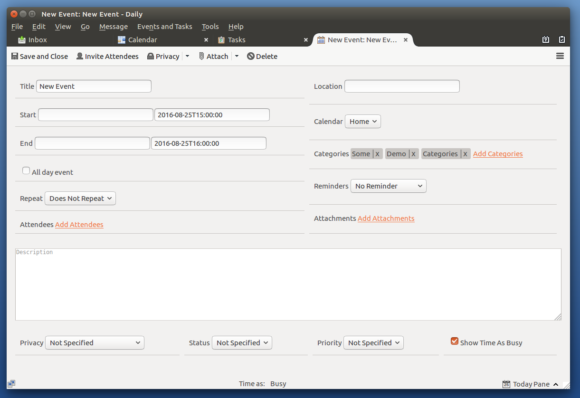 The screenshot above shows the current XUL-based UI ported to a tab. I ended up not having much time to work on the new HTML-based UI (actually only a week or so) and did not get as far on it as I’d hoped — only as far as a basic and preliminary implementation, a starting point for further development rather than something that can be used today. For example, it does not yet support saving changes and not all of the data is loaded into the UI for a given event or task. Some aspects do already work, like the responsive design where the UI changes to adapt to the width of the window, taking more advantage of the greater space available in a tab. Here are two screen shots that show the wide and narrow views (click to enlarge). Even though the HTML UI is not ready for use yet, we decided to go ahead and land it in the code base as a work-in-progress for further development. So if you are curious to see where it stands, it can also be turned on with a hidden preference (“calendar.item.useNewItemUI”) in a current development version of Thunderbird, as described above. Again, be sure to use a separate profile and/or make sure your data is backed up. For more technical details about the project, including some high-level documentation I wrote for this part of the code, see the meta bug, especially my comment #2 which summarizes the state of things as of the end of the Summer of Code period. It was a great summer working on this project. I learned a lot and enjoyed contributing. As my time permits, I hope to continue to contribute and finish the implementation of the new UI. Many thanks to Google, Mozilla, and especially to my mentors Philipp Kewisch (Fallen) and MakeMyDay for their guidance and tireless willingness to answer my questions and review code. Also thanks to Richard Marti (Paenglab) for his help and feedback on the UI design work. I wish there was another month of the official coding period to get the HTML implementation further along, but alas, so far we’ve only been able to help people manage their time, not actually generate more of it. This entry was posted on Tuesday, August 30th, 2016 at 3:14 pm	and is filed under Uncategorized. You can follow any comments to this entry through the RSS 2.0 feed. You can leave a comment, or trackback from your own site. © 2019. Mozilla Calendar Project Blog. Powered by WordPress. Cleanr theme by WPShoppe.